Enjoy fast paced riding on top quality riding horses! Suitable for intermediate plus fit riders. Rates are quoted per person sharing. It may be possible to ride if you exceed weight of 85kg by paying a supplement tbc please enquire. Excludes – Flights, transfers, drinks & tips. Airport transfers are US$55 each way. Your host, Sally Vergette, comes from the UK and grew up showing and show jumping. 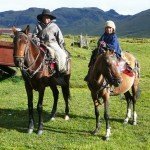 A complete change of lifestyle some 15 years ago led her to setting up a very unique and thriving horse riding holiday business in South America. 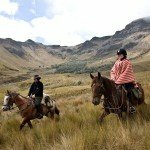 You’ll just love the forward going horses, remote riding and the very comfortable haciendas, which makes this such a memorable horse riding holiday in Ecuador. 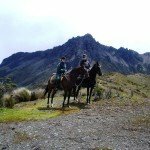 Enjoy these magnificent Horse Riding Trails. 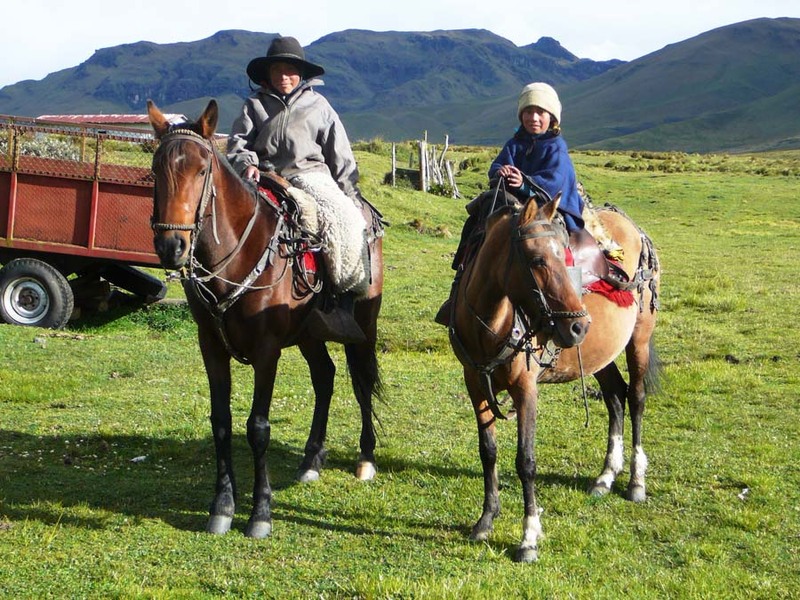 Join Sally on her top quality riding horses and enjoy fast paced riding in two stunning yet very distinct areas of Ecuador, in the heart of the Andes. 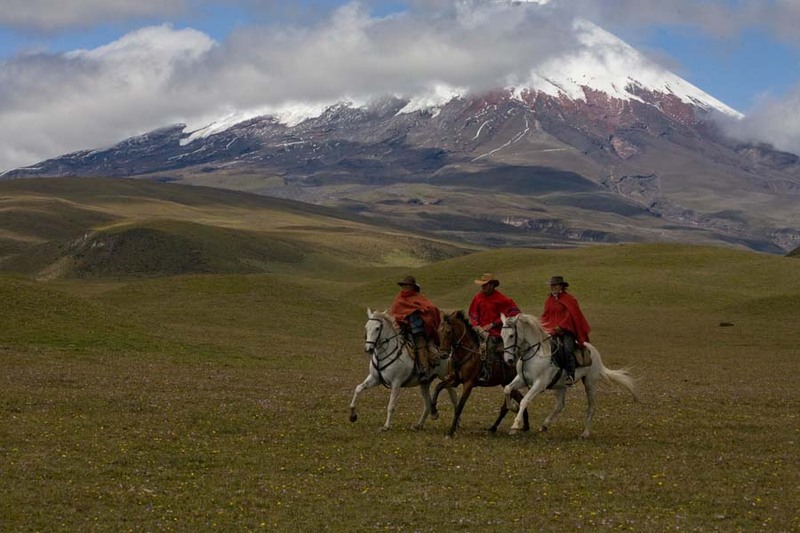 Accompanied by local horsemen, we start the rides on grassy tracks between the patchwork fields of the verdant valleys of the northern highlands and end the ride with long canters across the arid plains in the national park, just below the magnificent snow-capped ‘Cotopaxi Volcano’. 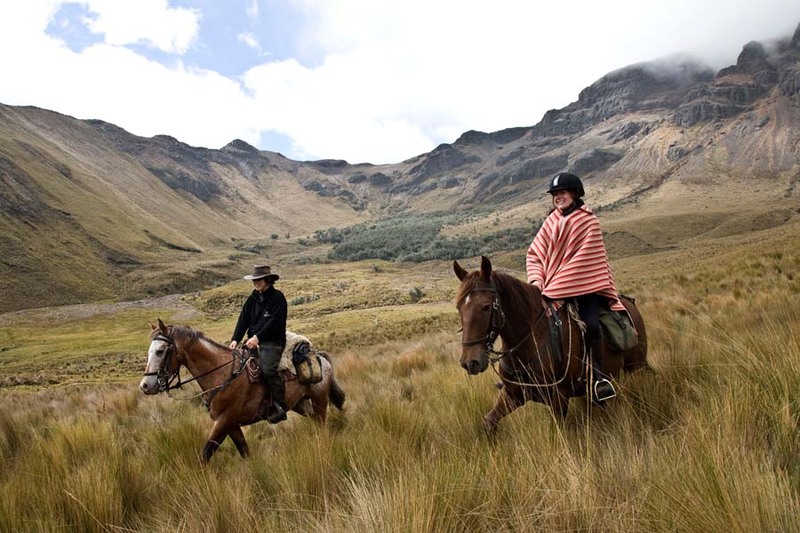 The Horse Riding Trails now include the wild Andean ‘paramo’ grasslands. 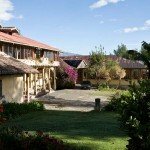 Guests stay at or visit a wonderful selection of different historic haciendas, some built by the first Spanish settlers and one based on Inca walls, and a working farm. 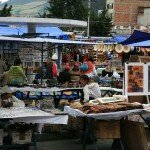 Other visits along the way include two market visits – the famous ‘Otavalo’ market and the fascinating local market at Saquisili. You pass through villages which are home to very friendly Ecuadorians in their vibrant traditional dress going about their daily tasks; the children shepherding the unruly pigs and sheep and the farmers working the land in much the same way as their forefathers did. 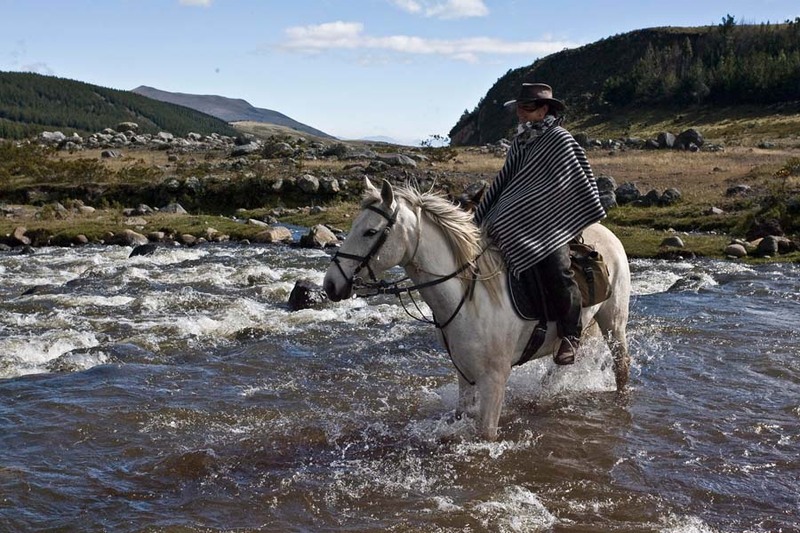 This is a fascinating insight into Andean country life. Note that the riding is at high altitude therefore we always recommend to arrive a day earlier to acclimatise. 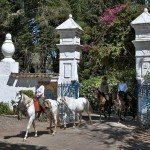 Horses – The local Criollo crossed with Andalusian, Arab, Thoroughbred & Peruvian Paso. All the horses are well trained, responsive, and ideally suited to the terrain, ranging from 14.2hh – 15.2hh. 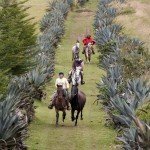 Horse Riding Trails Level of Riding & Pace – Intermediate to Advanced. There are long days spend in the saddle and good general fitness is also required. Horse Riding Trails Tack – McClennon saddles on which you can ride both Western or English style. Plus, English saddles are available with prior arrangement. Horse Riding Trails Weight Restriction – 13.5 Stone / 85 kg but we can also take up to 15 Stone / 95 kg – we need to know this maximum weight at time of booking to confirm availability of the bigger horses. 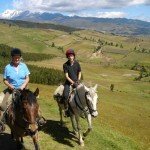 Horse Riding Trails Group Size – Maximum 10, except Xmas & New Year. 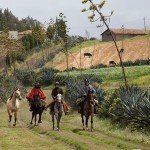 Over the course of these Horse Riding Trails, a variety of accommodation is used depending on the itinerary. 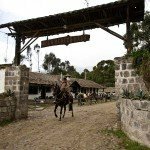 On the ‘Hacienda to Hacienda’ rides, nights are at a selection of Ecuador’s old Haciendas, many of which date back to the 17th and 18th Century, some which are now hotels and some that still house descendants of the country’s noblest families. 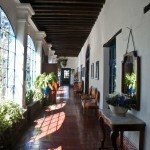 These Haciendas, with their antique filled rooms, hold an important position in the country’s history and staying at them gives a wonderful insight into Spanish colonial life. 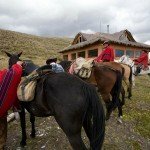 On the ‘Andean Adventurer’ & ‘Vista & Volcano’ rides nights are spent at more simple haciendas, local farms (‘fincas’) and guest houses which are simple and rustic but comfortable. Food is of a very good standard with a mix of cooked and simple breakfasts, packed lunches and 2 & 3 course evening meals, depending on whether the overnight is at a hotel hacienda or a more simple, family run accommodation. Expect things like eggs, porridge, fresh breads, meats, cheese, soups and local, traditional Ecaudorian fayre, coupled with European dishes. 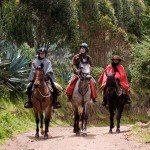 Horse Riding Holidays like this Horse Riding Trails holiday are part of the Zara’s Planet collection of Horse Riding Holidays Ecuador. 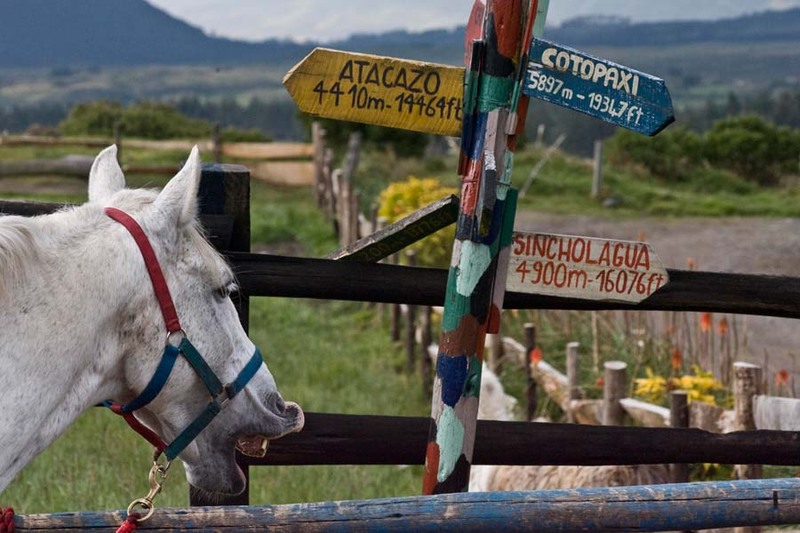 Note: All Horse Riding Trails itineraries are subject to change. You will be transferred from Quito and driven into the northern highlands of Ecuador. The drive takes you through an arid valley with avocado orchards then into Imbabura Province ‘the land of the lakes’. 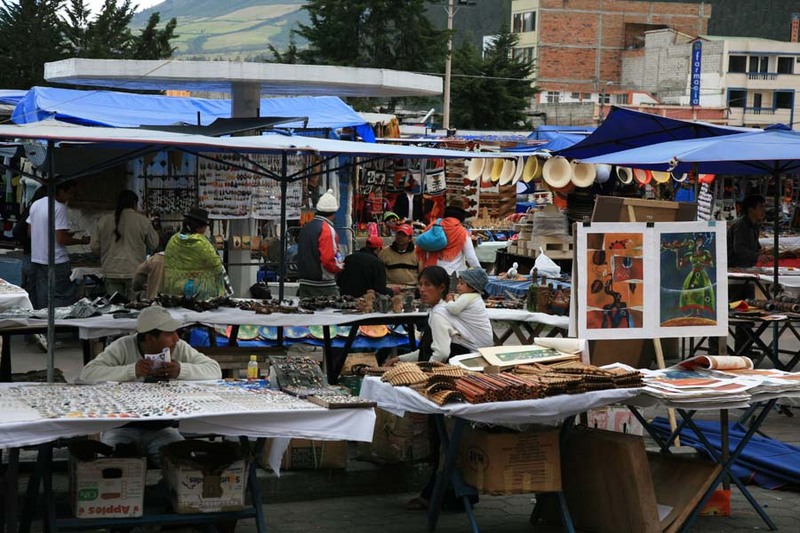 Visit the famous Otavalo market on this the busiest day of the week. (NB: The ride can sometimes start on other days, when the market in Otavalo is less busy). As well as the bustling craft market and stalls with exotic fruit, there is a food market where the locals - dressed in their very distinctive traditional costume - come down from their tiny farms in the mountains to sell their farm produce and buy their weekly supplies. 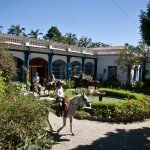 Then follows a short drive to a hacienda frequented by the great South American liberator, Simon Bolivar (a journey of c.2 hrs.). 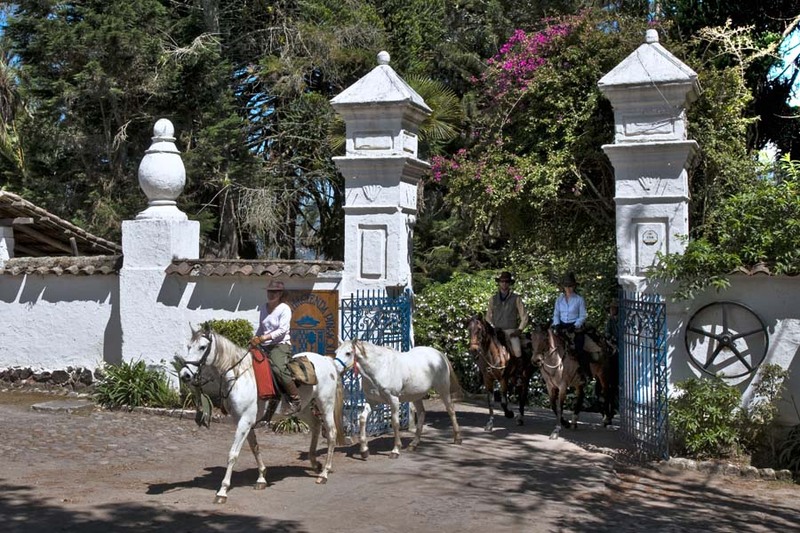 Members of the charming family (horse fanatics themselves) that have owned the hacienda for several centuries greet us warmly. With its courtyards, ornate fountains, terraces and gardens graced with citrus, palm and monkey puzzle trees it is an ideal location to leisurely drift into the relaxing Andean surroundings. The introductory ride (c.3-4hours) will take you along the tracks and through the tiny fields and hamlets of the surrounding area. It is common to see the very friendly but dignified locals in their immaculate traditional dress working in the fields by using hand tools or cattle to work the land. These tiny fields are surrounded by stone walls and earth banks topped with sisal plants and an array of wild flowers. 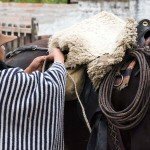 The ride will begin slowly so that you can try out your horse; the guides and grooms are always at hand to help. On return from riding, have a welcome drink, often accompanied by the music of an excellent Andean band. Dinner and overnight at Hacienda Pinsaqui, (or similar). 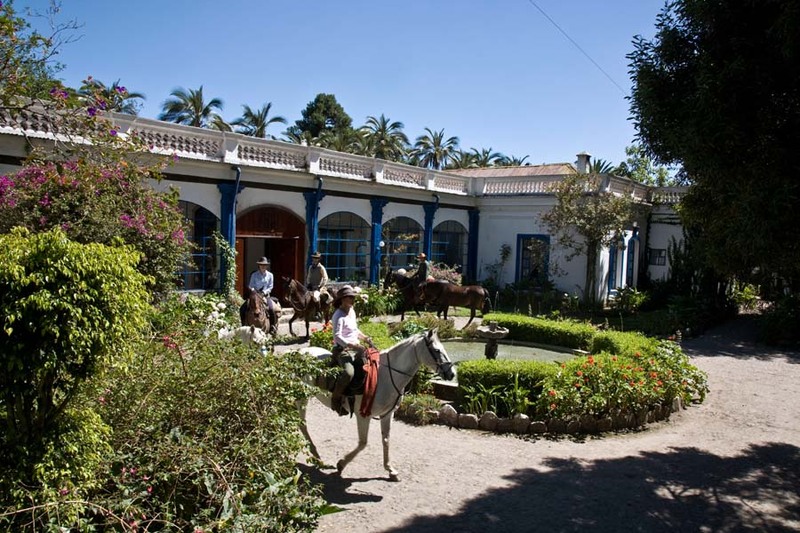 Leave this hacienda behind and ride on to another colonial hacienda, (c. 5 hours). Ride past tiny hamlets of adobe huts, through woodlands, cross rocky gorges and wind our way around the patchwork fields of quinoa, potatoes, maize and tree tomato orchards. 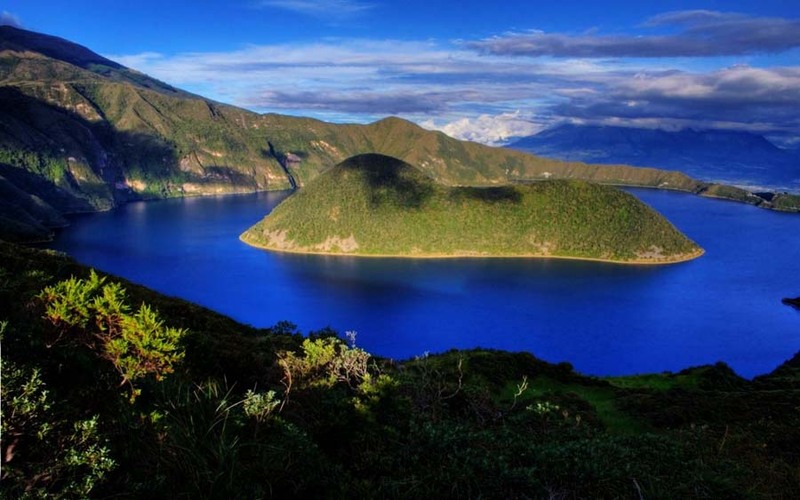 Magnificent views of the San Pablo Lake and the jagged Mojanda summit as we ride across the slopes of the sacred Imbabura Volcano (extinct) - the focus of many Inca legends. As well as seeing a great variety of exotic Andean fruits and other crops, you might meet the locals in vibrant traditional dress going about their daily tasks, the children shepherding the unruly pigs and sheep - trying to keep them off the crops. 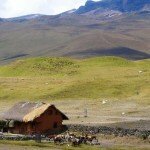 A fascinating insight into Andean country life. In the late afternoon, perhaps wander through the beautiful flowering gardens admiring the avocado trees, bromeliads, orchids and kitchen garden with passion fruit, tree tomato and a host of other interesting plants. This afternoon there is also an optional visit to a family of local weavers, (no additional cost). Drive through small villages with thriving cottage industries, to visit a family of local weavers. 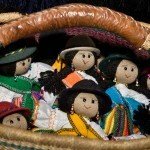 This family still produces exceptionally fine, unique rugs using the ancient pre-Inca back strap loom that most weavers have abandoned in favour of more modern looms. The wool is still dyed using plants and then hand spun as the family sticks rigidly to the traditional weaving processes. Dinner and overnight at Hacienda Cusin, (or similar). A stunning ride into the beautiful pastoral Zuleta Valley (c.6-7 hours). Along country lanes then through eucalyptus forests, we rise out of San Pablo Valley enjoying wonderful views across the lake and also of Imbabura volcano, riding onto the plains beyond for the chance of some faster-pace riding. Views of Zuleta valley, the verdant gorges and the ‘paramo’ (the unique Andean habitat of high grasslands) as you pass dew-ponds and hedges of aloe vera and spikey agave (sisal) atop mud walls. 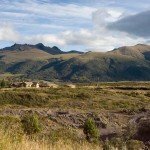 Following sandy tracks, you then descend into the Zuleta valley with dramatic views across to the hanging valleys and rocky ridges above. With views of the ancient tumili and earth pyramids erected by the pre-Inca population, ride on to the middle of this tranquil valley, seldom visited by tourists. There may be a chance to see the mighty Andean Condor as well as other species such as hummingbirds and bright scarlet flycatchers. In the afternoon, perhaps walk to a nearby village to see examples of the hand embroidery that has made the valley famous. 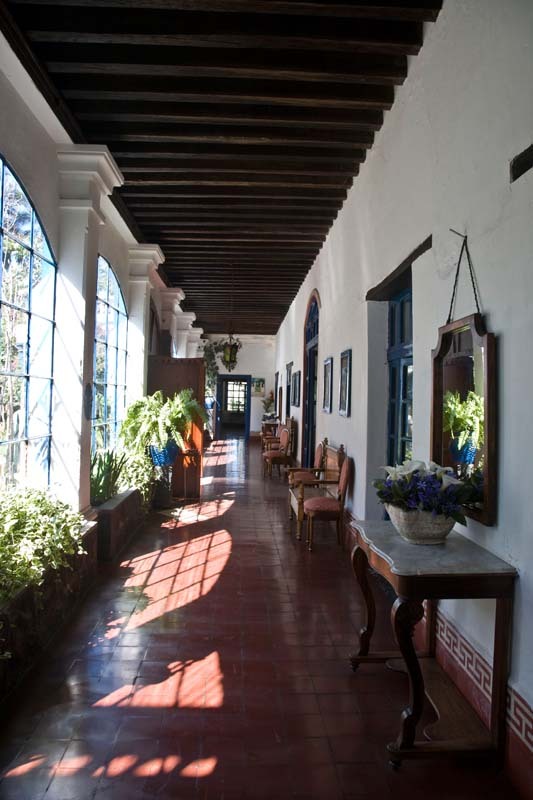 Dinner and overnight at Hacienda La Merced, (or similar). This morning there is the chance to get to know about the Andalucian breed, the farm owners will chat with you about their champion horses. Then ride along grass tracks, soon gaining height. Leaving the valley floor there are spectacular views to be had: north down the Zuleta Valley to three peaks on the horizon and west across the array of patchwork fields, every imaginable shade of green to Imbabura peak. You maybe lucky enough to catch sight of the Andean Condor. 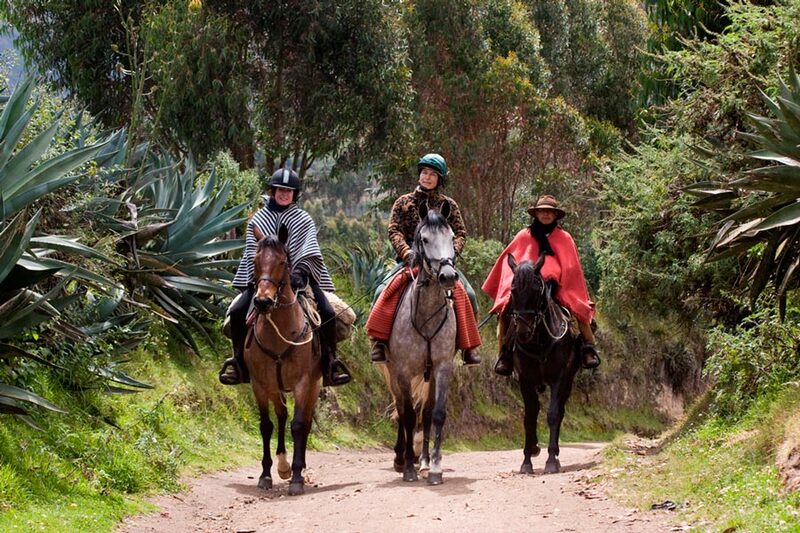 Ride up out of the valley through a large eucalyptus forest. Cantering along the shady tracks between the rows of tall eucalyptus is a different experience to what you have encountered on the ride so far. Often you will meet the locals with small herds of sheep, goats, pigs and cattle. 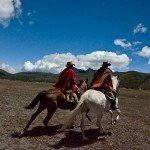 Head out across the Pesillo plains, into the Cayambe Valley dominated by the snow-capped Cayambe Volcano, which straddles the Equator Line arriving at a typical village square we leave the horses, (c. 4 hours of riding). 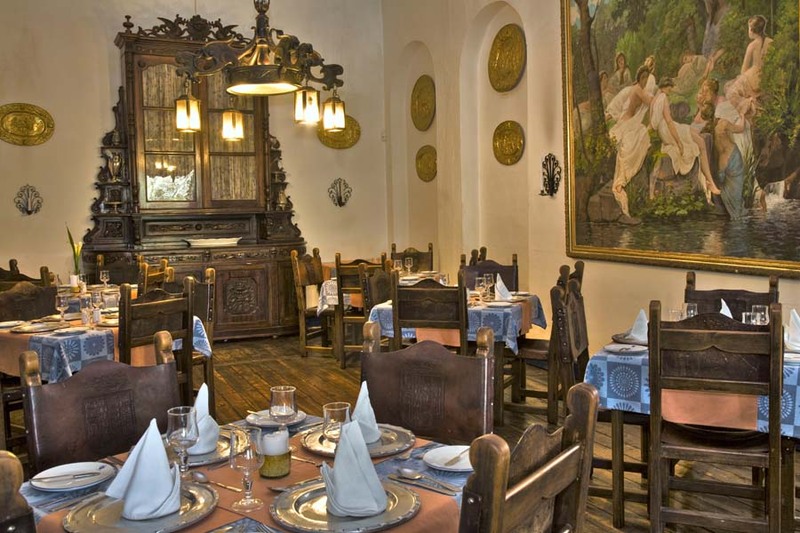 A short drive takes you to a beautiful old hacienda for a delicious home cooked lunch with traditional dishes. After lunch, visit a nearby rose plantation if there is time. 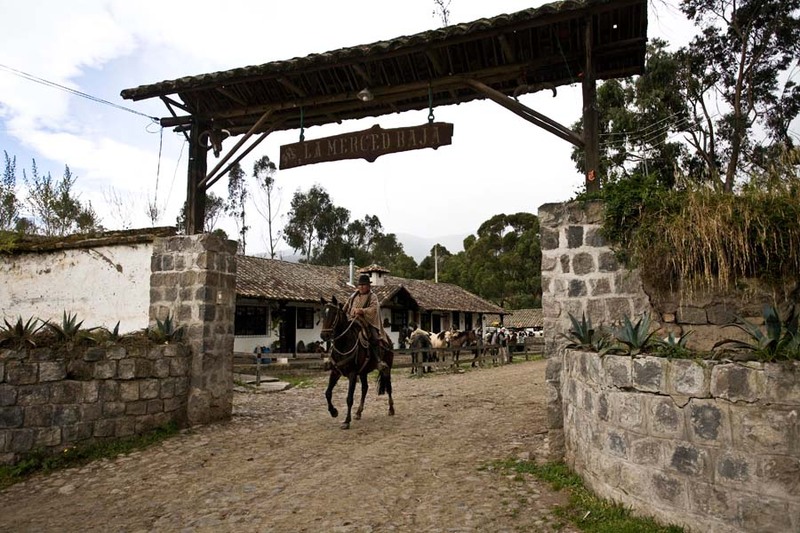 Then cross the Equator Line and travel (c. 2-3 hrs), bypassing Quito, to another comfortable hacienda. Your accommodation for this evening features a swimming pool, jacuzzi, sauna and Turkish Bath. There is sometimes the chance for a massage (payable locally). Dinner and overnight at La Carriona (or similar). The day starts with a drive to meet the horses. Leaving the farmlands behind, a spectacular ride awaits (c.7 hours). 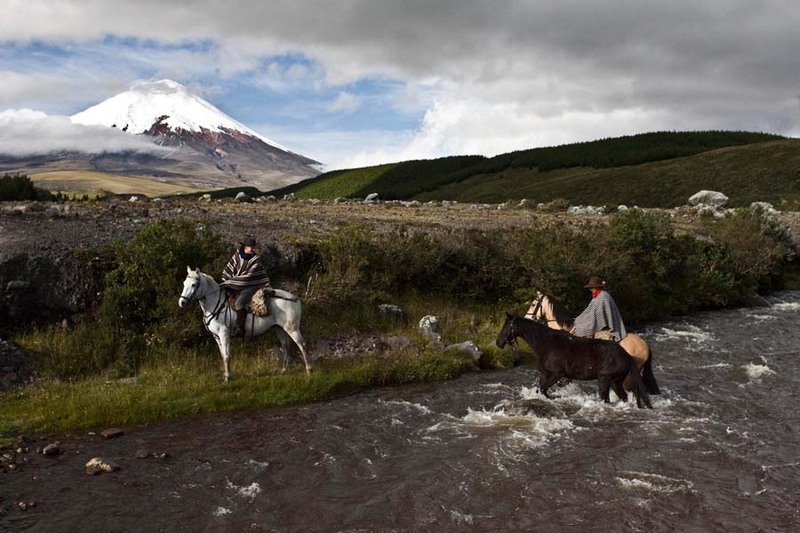 Cross the Sincholagua foothills to the northern edge of the Cotopaxi national park. 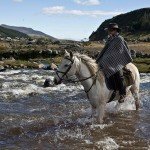 Perhaps start with some canters through dramatic Andean scenery, then traverse a series of huge gorges along tracks and riding across the remote ‘paramo’ wilderness. 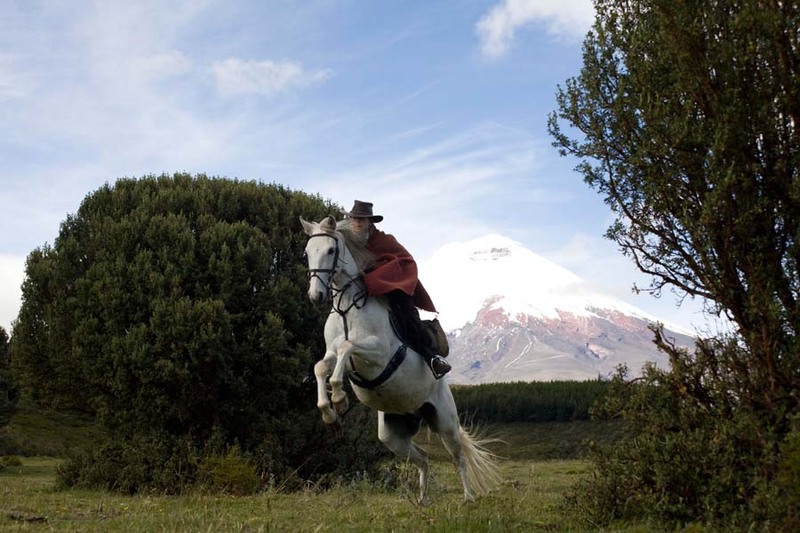 Then descend and, once on the pasturelands, there may be the chance for some exhilarating canters across the pastures and ride towards Cotopaxi National Park approaching the perfectly conical shape of the snow-capped Cotopaxi Volcano (the highest active volcano in the world). Sincholagua, a rocky summit that dominates the skyline, clearly marks the continental divide – the precipitation that falls the western side runs down and ends up on the Ecuadorian coast, in the Pacific Ocean, while that of the eastern sides eventually joins the Amazon and goes on to the Atlantic Ocean, via Brazil. Having avoided the fighting bulls (the hacienda we cross is famous for its feisty Spanish bulls! ), turn westwards, cross a river and arrive for the night at your accommodation. The accommodation this evening will be either at a hacienda or a mountain inn. The decision will be based on the number of guests (one has too few rooms to accommodate larger groups). Both lodgings are situated in idyllic locations with stunning views, cosy rooms and excellent food. 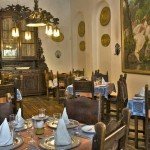 Dinner and overnight at Hosteria Chilcabamba or Hacienda Los Mortinos (or similar). 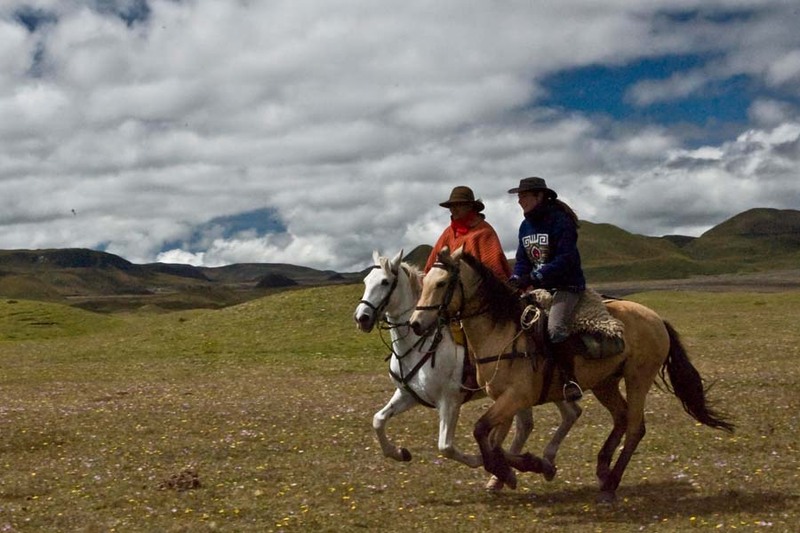 A day riding in the wild open expanses of the Andean highlands enjoying the open terrain (c.6 hours). 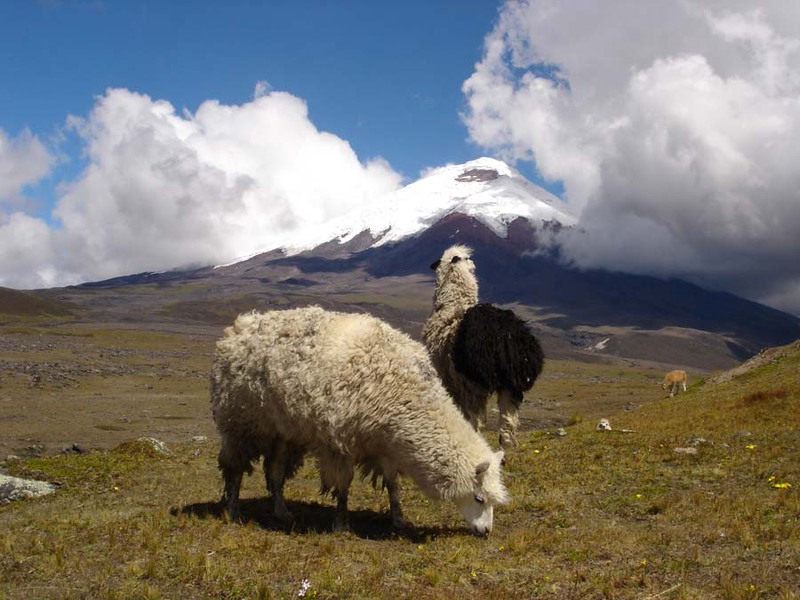 There are no signs of habitation and many spectacular views of the close-by Cotopaxi snow-capped volcano to be enjoyed. 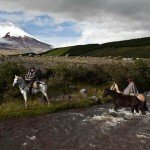 Ride into Cotopaxi national park to cross the wide, barren plains at the base of the Cotopaxi Volcano. Perhaps ride close to the wild horses that inhabit the park on your way across the plains. 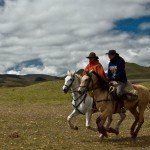 Part of this ride follows the main Inca highway which linked Quito with Cusco as well as the Inca route leading down to the Amazon. Ride to the old Inca fort that guarded this supply route. The ground is covered with tiny pumice stones and lichen on this arid plain created by lava and ash from Cotopaxi volcano. Then ride across a very surprising ‘luna landscape’ – huge boulders and hard baked ochre-coloured mud, between fascinating glacial and volcanic features and onto rolling grassy hills perhaps for some faster paced riding. After a picnic lunch amidst this stunning scenery, ride out of the national park to a recently converted old Jesuit Hacienda seeped in history and now a very comfortable highland hacienda. Dinner and overnight at Hacienda Santa Ana, (or similar). Set out on horseback for a ride amid the vast Andean scenery, cross a river and head north down a scenic valley towards civilization and Quito (c. 5-6 hours). Pass polylepis trees (‘paperbark trees’), alisos and other native trees and plants. Cross wooden bridges, ride through streams and along sandy tracks. There should be the chance of some final canters across the pastures, avoiding encounters with the fighting bulls. 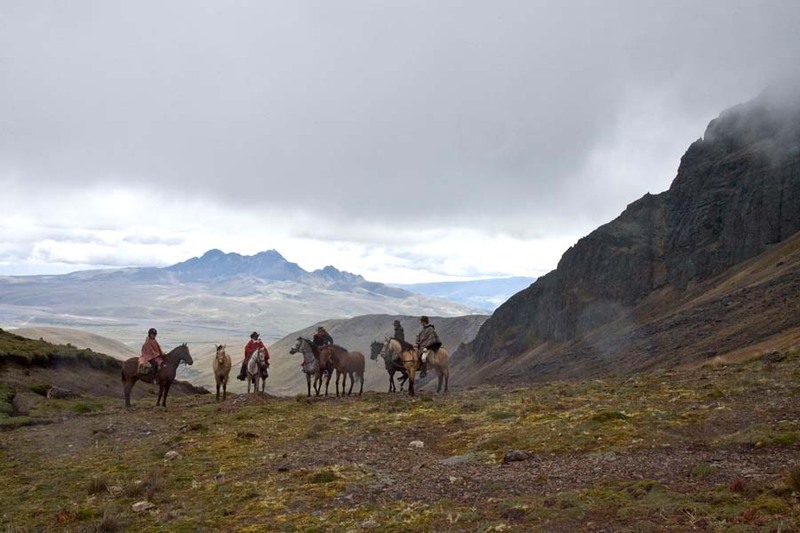 You may meet the local horsemen (chagras) checking the cattle and perhaps see Andean Condors en route, as well as eagles, hawks, kestrel, fox and deer. Descend into the valley along a lane bordered with native trees and shrubs. Hummingbirds, finches, flycatchers and other bird species often flit tree to tree in front of the horses. 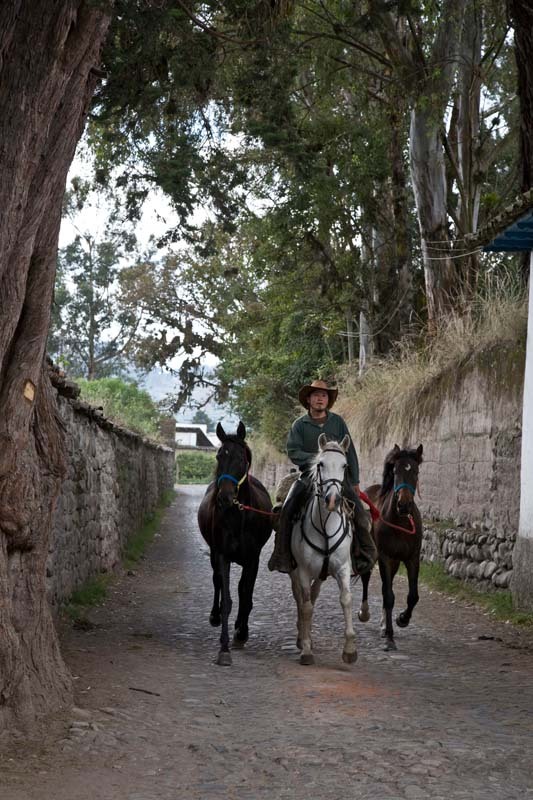 On reaching cobbled roads again, it is time to say goodbye to the horses and the chagras who have helped you along the way. Transfer by vehicle to Quito, a journey of around 1 hour and 15 minutes. Overnight at Hotel Sebastian in Quito, (or similar). Dinner to own account tonight. Following breakfast, make your own way to the airport in time for your flight home or onward travel. The meeting point today is in the Mariscal district of Quito. Drive out of the city and meet the horses, a journey of approximately one hour. 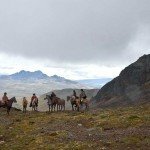 This first day offers a varied route, with stunning Andean scenery and a first taste of the distinct Andean ‘paramo’ vegetation. 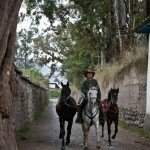 Once everyone is comfortable with their horses, you will set out on an introductory ride, accompanied by a local ‘chagra’ (horseman). The views are spectacular; looking out across the green valleys to the jagged rocky summits beyond. There is a good chance of seeing a condor, although this very much depends on flying conditions! 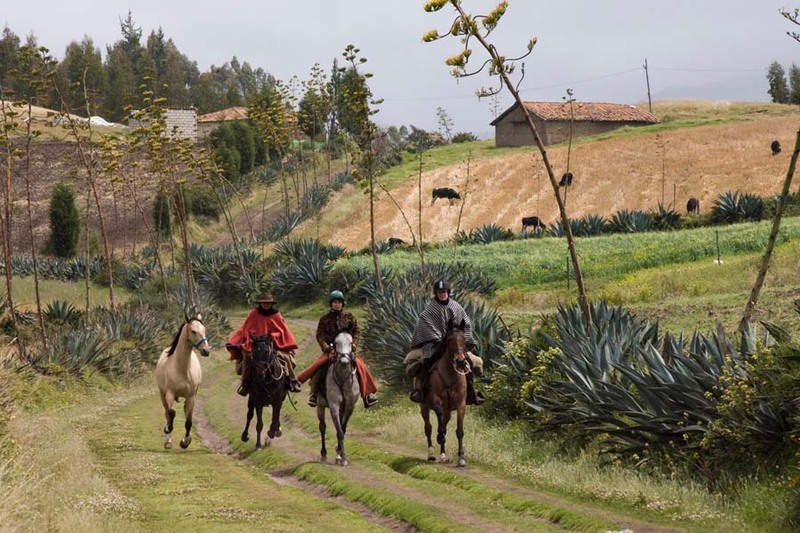 Leaving the pigs & donkeys grazing on the tracks and the fields of potatoes, maize and beans behind us, climb into the wild ‘paramo’ vegetation in the Antisana foothills – onto open grasslands, then descend to a working hacienda for overnight. The Hacienda house has recently been converted. Experience the impressive views and enjoy traditional home-cooked food tonight. Dinner and overnight at Hacienda Achupallas (or similar). There are single, twins, double and triple rooms at this hacienda, most with en-suite bathrooms. Riding time: c. 5-6 hours. Ride out of the farm and climb towards ‘Muerto Pungo’ Lake along dirt tracks through a sea of grass, again with incredible vistas. There is plenty of wildlife and flora to see from the smallest bird in the world, hummingbirds, to Condors, which are the heaviest flying bird in the world. There are many other bird species as well as native flowers and shrubs. The views extend to distant snow-capped volcanoes and to Quito. Peaks such as Antisana, Sincholagua, Pichincha, the Iliniza twin peaks and Cotopaxi Volcano come into sight. Arriving at the highland Lake ‘Muerte Pungo’, see a fascinating old lava flow and its exit hole. After a relaxing picnic lunch taken from our saddle bags, it is back on to the horses for a few more hours' pioneering our way through the wild flower-filled rough grasslands, before finally dropping down into a secluded valley. 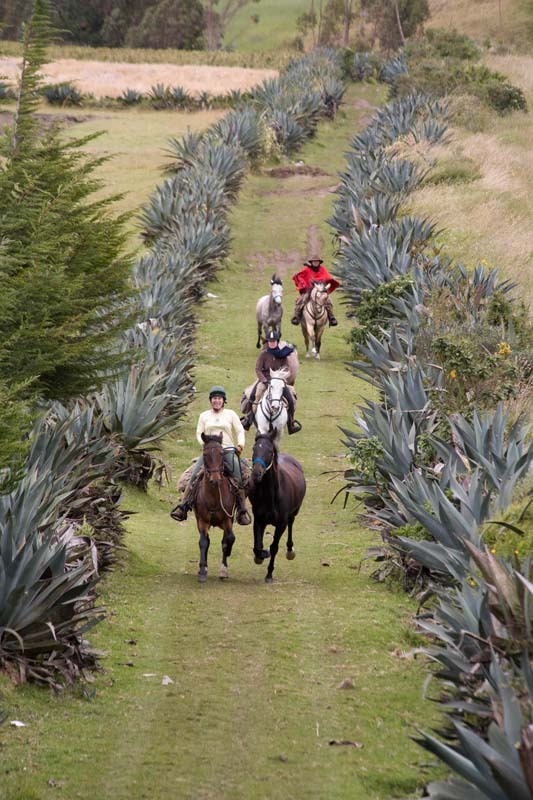 Leave the horses in pastures and head back to Hacienda Achupallas (or similar) for a second night. It is just a short drive by vehicle. Riding time: c. 6 hours. 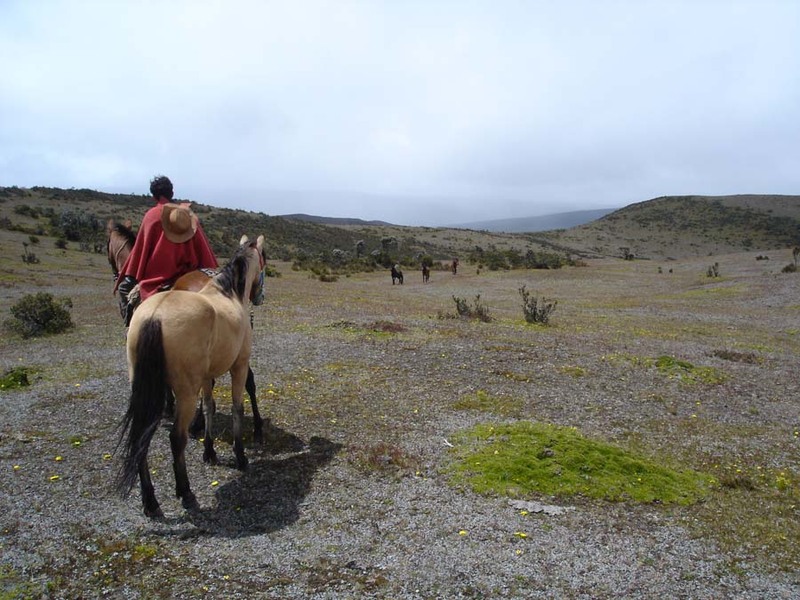 The morning starts with riding through the open expanses of ‘paramo’, far off the beaten track, enjoy the tranquillity of this seldom-visited breath-taking area. The chagras guide us through this landscape as they spend their lives up here so they can carefully lead the ride between the muddy wetlands. 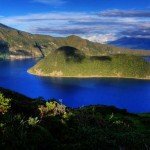 Ride up the scree slopes and rocky outcrops of Sincholagua volcano, crossing over the continental divide – the watershed where drops of water landing so close together end up oceans apart – in the Pacific or the Atlantic. There are excellent views of many peculiar geological features such as drumlins, ‘hot spot’ hillocks, mud and lava flows produced during the ice age and by volcanic activity. 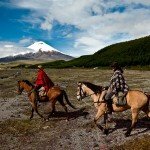 The pace may well pick up across the northern end of the Cotopaxi National Park. Ride on to a charming old adobe and thatch farmhouse, where you will overnight. Tonight, perhaps exchange stories with a pre-dinner glass of the local ‘fire water’ in front of a roaring fire. Dinner and overnight at Hacienda Porvenir, a thatched inn with partitioned rooms and shared bathrooms, (or similar). NB. Sometimes it is possible to pay extra to upgrade to a room with a private bathroom. Please ask for availability. Riding time: c. 7 hours. Today you should have the chance to take a closer look at the famous Spanish fighting bulls as you ride through the Hacienda lands. Curiously enough these fierce beasts were introduced into Ecuador by the Jesuit priests as a way of stopping their other animals being rustled. Skirting the rocky summit of Ruminahui, continue on into the National Park. Passing native Andean forests, the route flattens out as we descend into a hidden valley, a favourite haunt for Condors and wild horses. The pace quickens as you cross the open plains. The days' ride ends at a lodge close to Cotopaxi Volcano, with unbeatable views of this magnificent peak. Resident llamas often oblige and pose for photos. 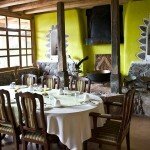 Dinner and overnight at Tambopaxi Lodge with single, twin, double and triple rooms and en-suite bathrooms (or similar). Riding time: c. 6 hours. An exhilarating day of riding awaits. 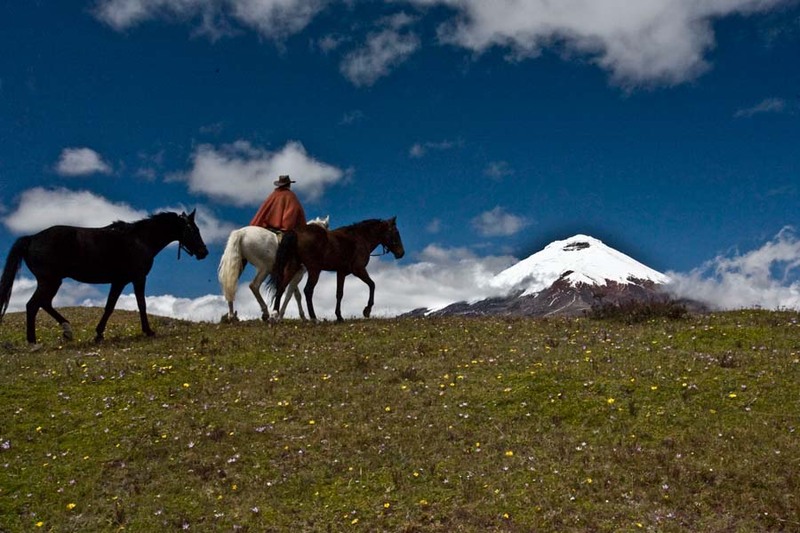 Journey on horseback through the western part of Cotopaxi National Park. There may be some faster paced riding across the flat plains. As you make your way through the rolling hills, there is the chance you may meet several herds of the wild horses that roam the park. The curious colts often run alongside us, long manes and tails flowing. Sometimes deer are seen and the Andean Condor often passes overhead. Cross lunar-like surfaces as we approach the snow-capped Cotopaxi Volcano. 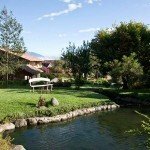 Then follow the main Inca highway linking Cusco and Quito, before heading to a new, very comfortable lodge located at the centre-point between the four mighty Andean peaks of Ruminahui, Pasachoa, Sincholagua and Cotopaxi. 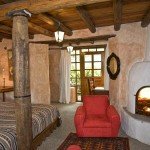 Dinner and overnight at Hacienda Los Mortinos, with single, twin and double rooms and en-suite bathrooms (or similar). Riding time: c. 5-6 hours. 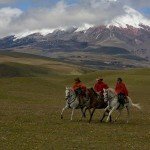 Today you will set off on the longest ride of the trip, covering 45km (c. 30 miles) through the northern section of the National Park and to the remote eastern flanks of the Cotopaxi Volcano, far off the beaten track. Flat plains, marshlands, volcanic rock fields, riverbeds are some of the distinct terrains to be traversed. 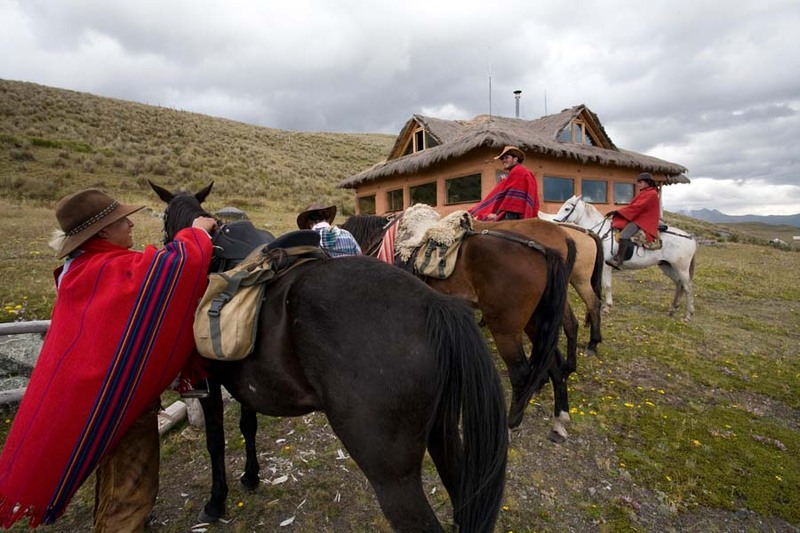 Follow an Inca route that led down to the Amazon for part of the way and the house we stay at tonight is a ‘tambo’ built out of Inca stone – log fires and lovely staff ensure a warm welcome. It is an incredible location. Here there is no light pollution and the Equator-line sky is packed with stars, including the Southern Cross. 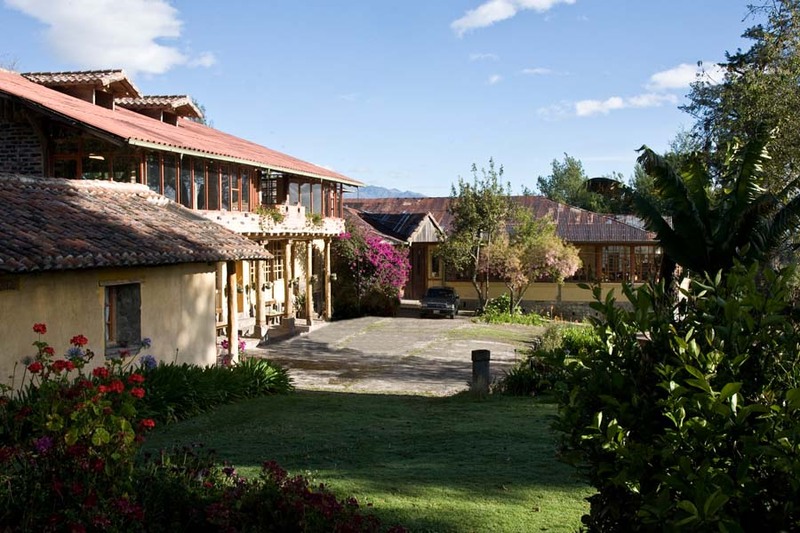 Dinner and overnight at Hacienda El Tambo, with twin-bedded rooms separated by partitions. This house is built of Inca stone; there is a generator running for part of the day/evening, after which candles are used. Shared bathrooms. Riding time: c. 7-8 hours. 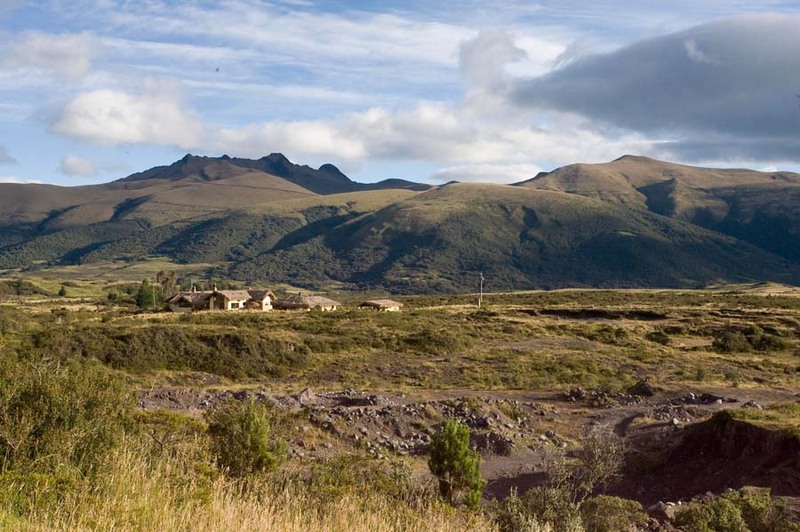 Wake to stunning views of the close-by Cotopaxi & Quilindana Volcanoes. Often you can also see the glacier on the Antisana Volcano on the horizon. This morning, you should have the chance to inspect the hacienda stone and turf corrals used for the feisty fighting bulls before we set off through another part of this wilderness. The exact route will depend on weather conditions, but will be almost as long as the previous day's ride. Travel along narrow tracks through the rough grasslands, cross several streams, ride through wetlands and then out onto sandy tracks perhaps for some faster riding across the huge expanses of open terrain. Ecuador’s highest peak, Chimborazo and Tungurahua, which is erupting regularly, can often be seen on the horizon. After descending into the very aptly named ‘Avenue of Volcanoes’, it is time to say farewell to your local guides and your trusty steeds and drive back to Quito to overnight. Overnight at Hotel Sierra Madre in Quito, (or similar). Riding time: c. 7 hours. Make your own way to the airport in time for your flight home/onward travel. 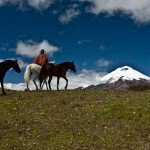 You are met at your hotel and driven north through the Andes, across the equator line to meet the horses in the shadow of the Cayambe Volcano, (a journey of approx. 90 mins). 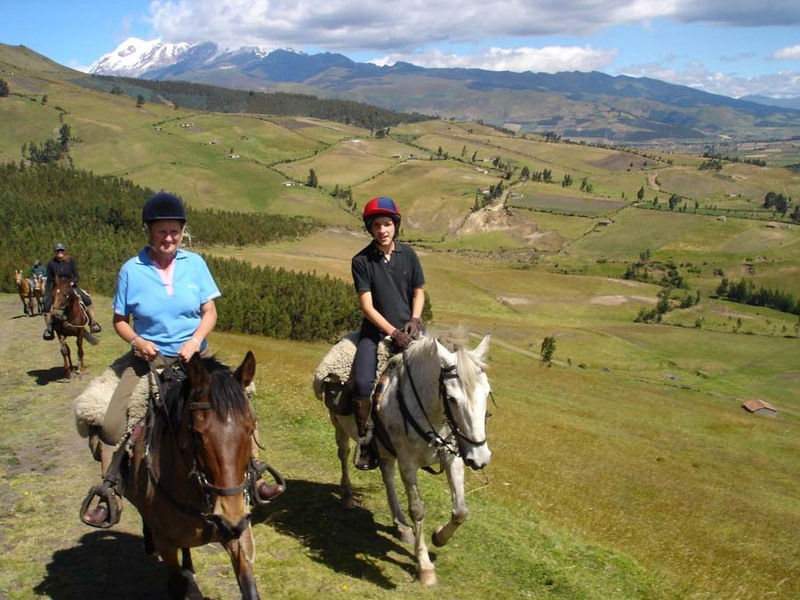 Ride out of the Cayambe Valley and down into the pastoral Zuleta Valley. Along grassy lanes and then across pastureland, experience picture-postcard scenery around every corner. Stop for a picnic along the way. Perhaps have some canters across the grasslands and then enter the grounds of the hacienda which is your accommodation for tonight. Pass the hacienda’s magnificent Andalucian stallions in their fields. 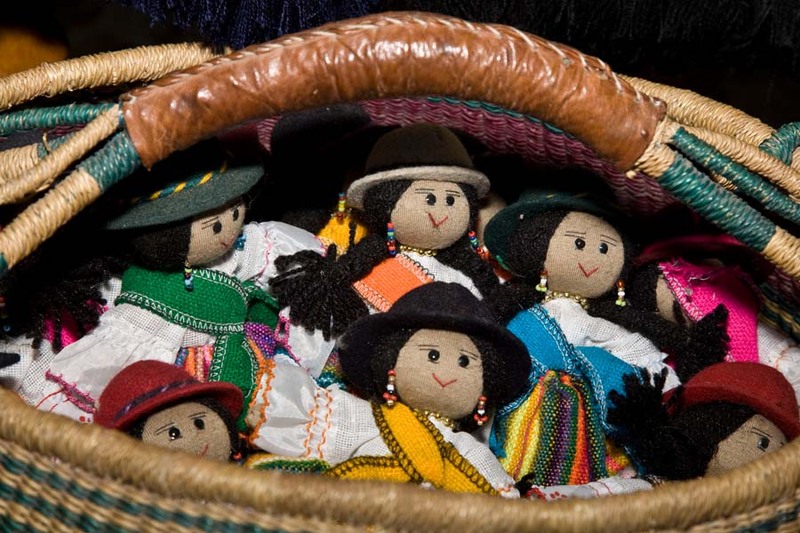 Your hosts are delightful people making this a very special introduction to Ecuadorian life.(Approx. 4 hrs of riding). 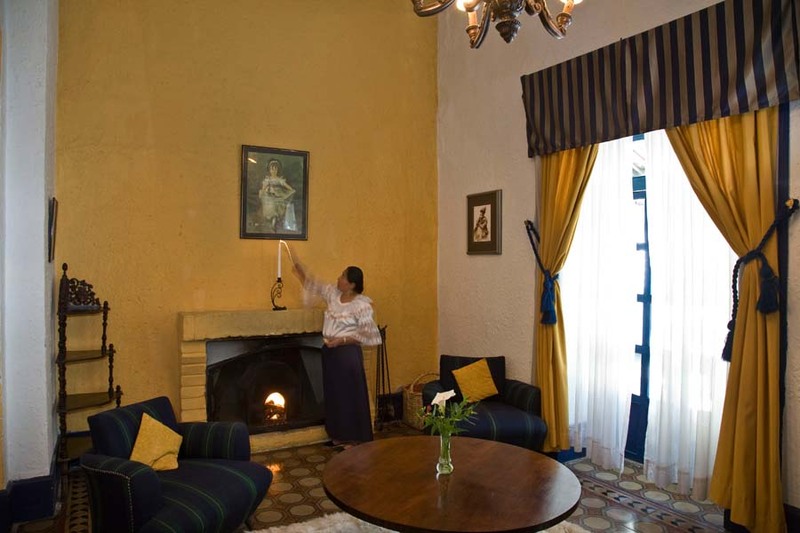 Dinner and overnight in en-suite rooms at Hacienda La Merced, (or similar). Today, set off on a long circular ride through the magnificent Zuleta Valley with superb views of the countryside and surrounding jagged peaks. As well as a host of other birds including tiny hummingbirds, the mighty Andean Condor is often spotted soaring overhead. There should be the chance for some long canters and the perfect opportunity to see local life as you pass small adobe huts. The very friendly locals still dress in their vibrant coloured traditional clothing. You may encounter herders out with flocks of sheep, goats, pigs in the open grasslands and a host of mismatched dogs supposedly keeping the animals in order! Lunch is a picnic out on the trail. Your afternoon ride will take you back to the hacienda. 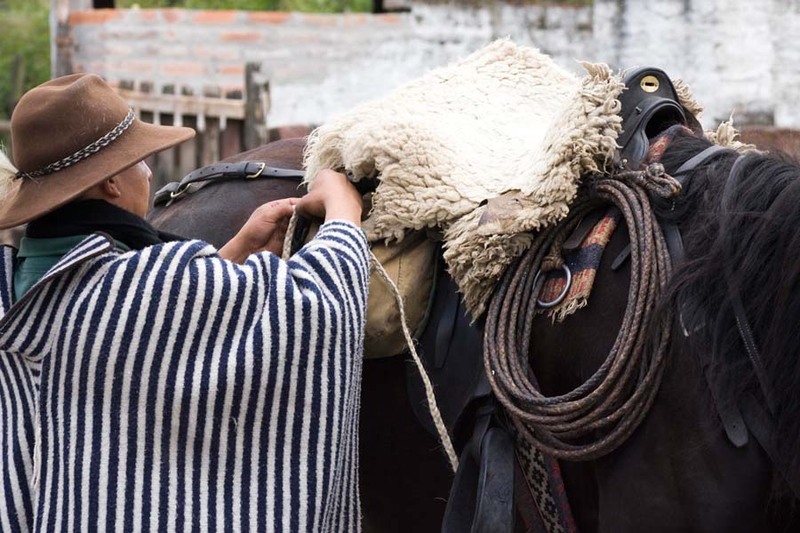 Before dinner, you may wish to take a closer look at the Andalucian horses with the owners, watch the cows being milked and enjoy the tranquil Andean life. (Approx. 6 hrs of riding). 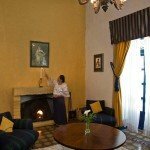 Dinner and overnight in en-suite rooms at Hacienda La Merced (or similar). Today's ride takes you in a westerly direction out of the Zuleta Valley and into the neighbouring San Pablo Valley, which is dominated by the lake. There should be some more opportunities for cantering as we ride across plains, through the beautiful verdant valleys. Then it is onwards through a series of hamlets, passing fields full of exotic fruits and vegetables. Eventually reaching the famous market town of Otavalo. A late afternoon visit to the colourful market, with the chance to purchase wonderful Andean crafts and take some photos of the ladies in their beautiful traditional dress. (Approx. 6 hrs of riding). Dinner and overnight at Dona Esther in Otavalo town, in rooms with en-suite bathrooms. It is an early start today for your journey south. There will be the chance for a quick stop on the Equator Line, before heading south along the side of the eastern Cordillera of the Andes, into the ‘Avenue of the Volcanoes’ (a journey of approx. 2.5 hrs). 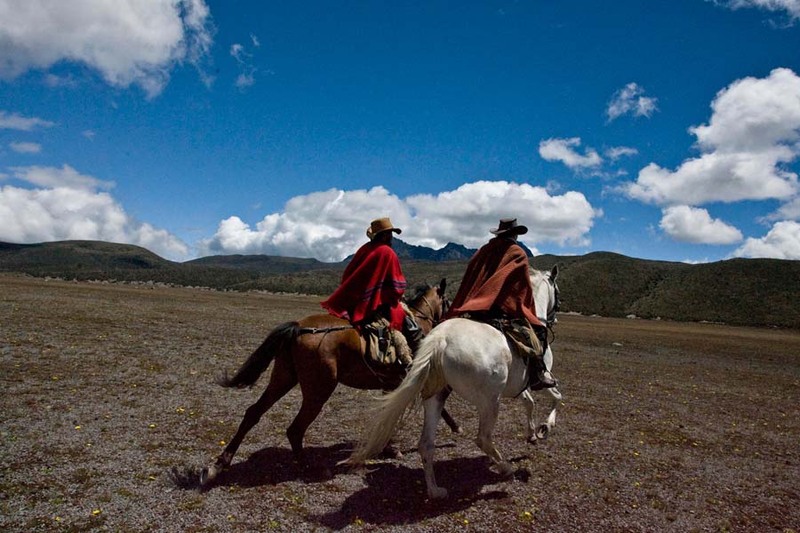 Ride out across the distinct Andean ‘paramo’ vegetation, accompanied by a local ‘chagra’ (horseman). The views are spectacular - looking out across the green valleys to the many rocky summits beyond. There is also a good chance of seeing Andean condors, but this very much depends on flying conditions! 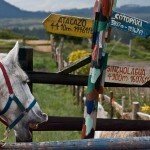 Leave the pigs and donkeys grazing on the tracks and the fields of potatoes, maize and beans behind and climb into the wild ‘paramo’ vegetation in the Antisana foothills. Then it is on to open grasslands before descending to a working farm for overnight. The Hacienda house has recently been converted. Experience the impressive views and enjoy traditional home-cooked food tonight. (Approx. 5-6 hrs of riding). Dinner and overnight at Hacienda Achupallas (or similar). There are single, twins, double and triple rooms at this hacienda, most with en-suite bathrooms. Ride out of the farm and climb towards ‘Muerto Pungo’ Lake along dirt tracks through a sea of grass, again with incredible vistas. There is plenty of wildlife and flora to see from hummingbirds (the smallest bird in the world) to Condors (the heaviest flying bird in the world). The views extend to distant snow-capped volcanoes and to Quito. See peaks such as Antisana, Sincholagua, Pichincha, the Iliniza twin peaks and Cotopaxi Volcano. Arriving at the highland lake ‘Muerte Pungo’, see a fascinating old lava flow and its exit hole. After a saddlebag picnic lunch it is back onto the horses for a few more hours pioneering our way through grasslands, before finally dropping down into a secluded valley. (Approx. 5-6 hrs of riding). Leave the horses in pastures and head back to Hacienda Achupallas (or similar) for a second night. It is just a short drive by vehicle. 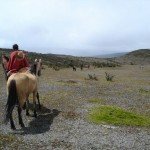 Your morning starts with riding through the open expanses of ‘paramo’, far off the beaten track you can enjoy the tranquillity of this seldom-visited and truly breath-taking area. The ‘chagras’ guide us through the landscape that they know so well, carefully leading the group through muddy wetlands. 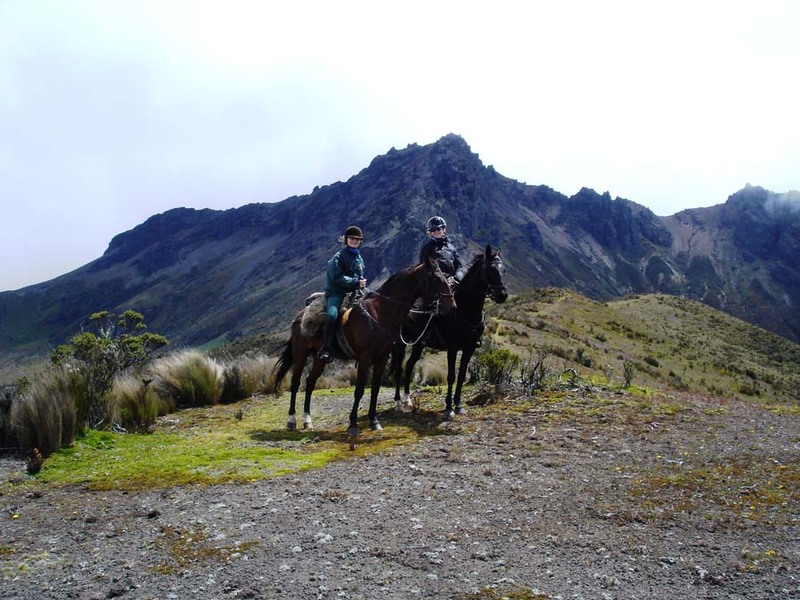 Ride up the scree slopes and rocky outcrops of Sincholagua volcano. Cross over the continental divide, the watershed where drops of water landing so close together end up oceans apart in the Pacific or in the Atlantic. 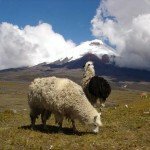 The pace may well pick up across the northern end of the Cotopaxi National Park. Ride on to a charming old adobe and thatch farmhouse, where you will overnight. Tonight, perhaps exchange stories with a pre-dinner glass of the local ‘fire water’ in front of a roaring fire. (Approx. 7 hrs of riding). Dinner and overnight at Hacienda Porvenir, a thatched inn with partitioned rooms and shared bathrooms, (or similar). NB. Sometimes it is possible to pay extra to upgrade to a room with a private bathroom. Please ask for availability. Today you should have the chance to take a closer look at the famous Spanish fighting bulls as you ride through the Hacienda lands. Curiously enough these fierce beasts were introduced into Ecuador by the Jesuit priests as a way of stopping their other animals being rustled. Skirting the rocky summit of Ruminahui, continue on into the National Park. Passing native Andean forests, the route flattens out as we descend into a hidden valley, a favourite haunt for Condors and wild horses. The can sometimes quicken as you cross the open plains. 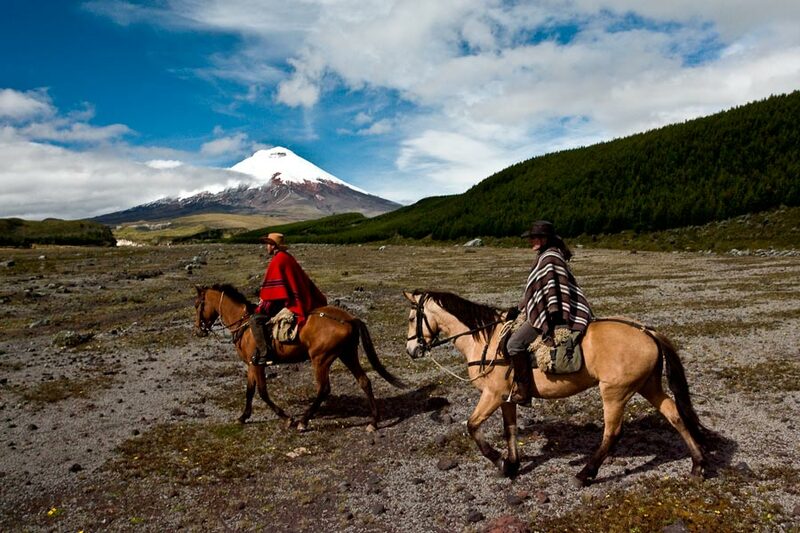 The days' ride ends at a lodge close to Cotopaxi Volcano, with unbeatable views of this magnificent peak. Resident llamas often oblige and pose for photos. (Approx. 6 hrs of riding). 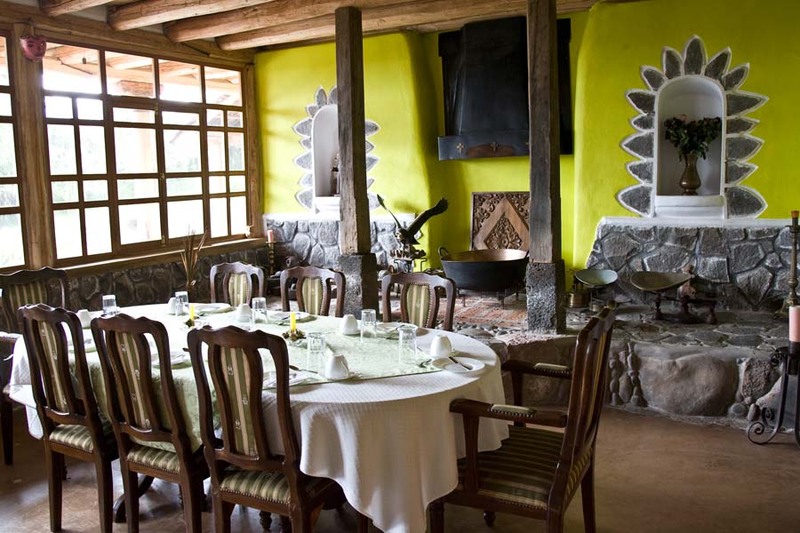 Dinner and overnight at Tambopaxi Lodge with single, twin, double and triple rooms and en-suite bathrooms (or similar). 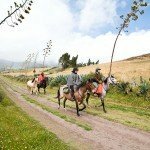 An exhilarating day of riding awaits; journey on horseback through the western part of Cotopaxi National Park. There may be some faster paced riding across the flat plains. As you make your way through the rolling hills, there is the chance you may meet several herds of the wild horses that roam the park. The curious colts often run alongside us, long manes and tails flowing. Sometimes deer are seen and the Andean Condor often passes overhead. Cross lunar-like surfaces as we approach the snow-capped Cotopaxi Volcano. 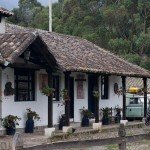 Then follow the main Inca highway linking Cusco and Quito, before heading to a new, very comfortable lodge located at the centre- point between the four mighty Andean peaks of Ruminahui, Pasachoa, Sincholagua and Cotopaxi. (Approx. 5-6 hours of riding). 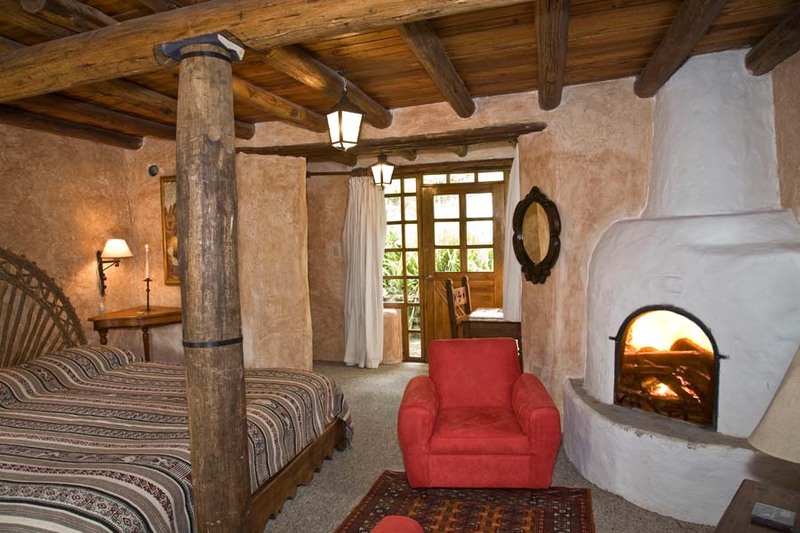 Dinner and overnight at Hacienda Los Mortinos, with single, twin and double rooms and en-suite bathrooms (or similar). 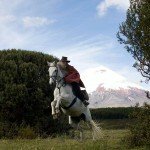 Today you will set off on the longest ride of the trip, covering 45km (c. 30 miles) through the northern section of the National Park and to the remote eastern flanks of the Cotopaxi Volcano, far off the beaten track. Flat plains, marshlands, volcanic rock fields, riverbeds are some of the distinct terrains to be traversed. 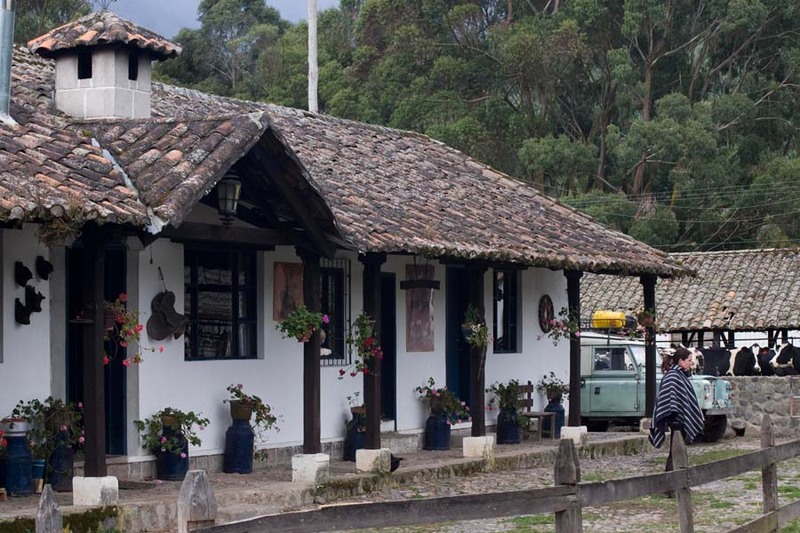 Follow an Inca route that led down to the Amazon for part of the way and the house we stay at tonight is a ‘tambo’ built out of Inca stone – log fires and lovely staff ensure a warm welcome. It is an incredible location. Here there is no light pollution and the Equator-line sky is packed with stars, including the Southern Cross. (Approx. 7-8 hrs of riding). Dinner and overnight at Hacienda El Tambo, with twin-bedded rooms separated by partitions. This house is built of Inca stone; there is a generator running for part of the day/evening, after which candles are used. Shared bathrooms. 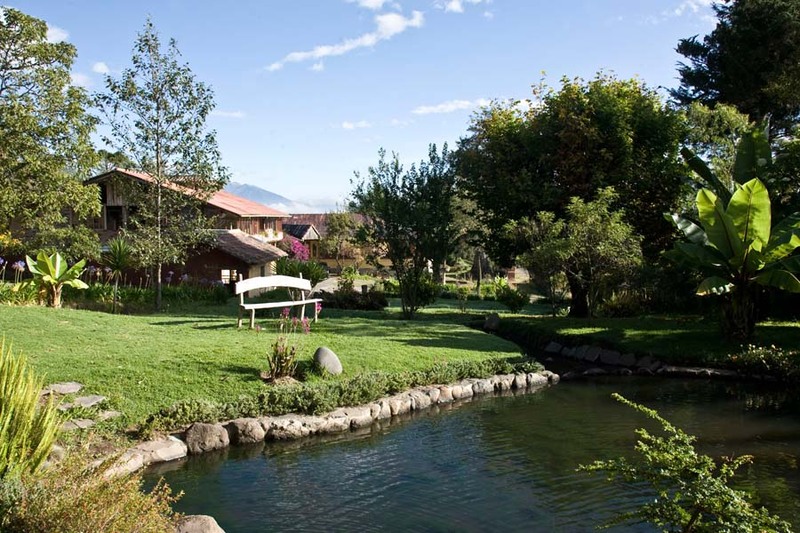 Wake to stunning views of the close-by Cotopaxi and Quilindana Volcanoes. Often you can also see the glacier on the Antisana Volcano on the horizon. This morning, you should have the chance to inspect the hacienda stone and turf corrals used for the feisty fighting bulls before we set off through another part of this wilderness. The exact route will depend on weather conditions, but will be almost as long as the previous day's ride. Travel along narrow tracks through the rough grasslands, cross several streams, ride through wetlands and then out onto sandy tracks perhaps for some faster riding across the huge expanses of open terrain. Ecuador’s highest peak, Chimborazo and Tungurahua, which erupts regularly, is often seen on the horizon. 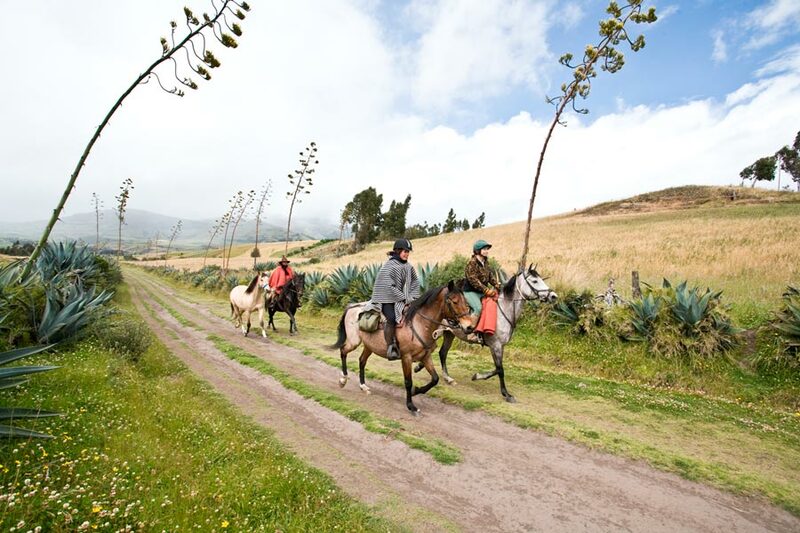 After descending into the aptly named ‘Avenue of Volcanoes’, it is time to say farewell to your local guides and your horse and drive back to Quito to overnight. (Approx. 7 hrs of riding). Overnight at Hotel Sierra Madre in Quito, (or similar). Another incredible trip, thank you so much! Your preparation notes were brilliant as was your fitness advice. It was quite tough as you pointed out, but worth every minute and having a nice bed and hot shower at the end of each day was wonderful.